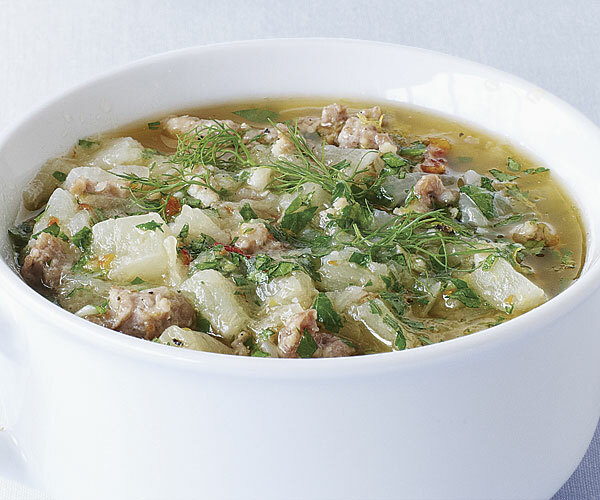 Make this with hot Italian sausage and you get a great spicy stewey soup. Make it with sweet Italian sausage and you get a delicious dish that your whole family will love. Make it with Kielbasa or andouille and you get a smoky, almost gumbo-like stew. Adrienne demoed this at US Botanic Garden March 6 and again at Brookside March 13, 2014. Adapted from Fine Cooking. Serves 6-12, depending on whether it’s a main course or a starter. Heat the oil in a Dutch oven over medium-high heat. Add the sausage and cook, stirring with a wooden spatula to break it up into small pieces, until it starts to caramelize, about 5 minutes. Remove with a slotted spoon and reserve. Add more olive oil as needed then add onion, and fennel and cover, turning heat down a bit; cook, stirring occasionally, until the onion begins to soften, about 10 minutes. Add the sherry and stir, scraping the bottom of the pot to loosen any browned bits, about 30 seconds. Add potato chunks, stir in the chicken broth and bring to a boil over high heat. Reduce the heat and simmer until the potatoes are tender when pierced with a fork, 30 minutes. Using the spatula or a potato masher, gently crush the cooked potatoes until most of them are mashed and the stew is somewhat thickened. Return the reserved cooked sausage to the pot. Add the parsley, sun-dried tomatoes, heavy cream, and lemon zest and stir until incorporated. Season with 1 t salt and ½ t pepper. Serve hot, garnished with the fennel fronds. This entry was posted in Soups and tagged fennel, gluten free, Italian sausage, parsley, potato, potatoes, sun-dried tomatoes. Bookmark the permalink.